The Wellington Zapatista Support Group (once headquartered at Wellington anarchist hangout 128 Abel Smith Street)is holding a fundraiser for "capacity-building workshops for health promoters in autonomous Zapatista communities in the southern Mexican state of Chiapas". 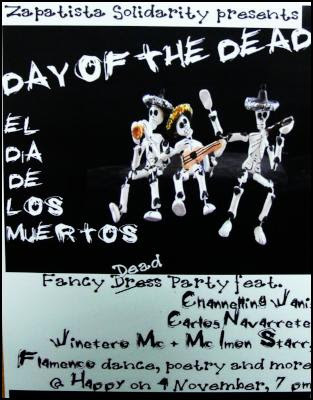 HAPPY is happy to host Wellington's first truly international Day of the Dead festival, to be held on Sunday 4th November, 7pm – late, cnr Vivian and Tory St. The proceeds from this fundraising event will go to providing capacity-building workshops for health promoters in autonomous Zapatista communities the southern Mexican state of Chiapas, one of the poorest in the country. Unlike many indigenous communities reduced to accepting government hand-outs, the Zapatistas are committed to the peaceful development and provision of their own health, education and justice services, using members of their own communities speaking their own indigenous languages. This requires training in several technical areas. We are doing our best to assist the Caracol of La Garrucha in the health sector with this important and essential work, by raising funds to enable capacity-building workshops in 2008 for the 50 health promoters of this zone. For info on Webb-Pullman's background and Cuban and Zapatista connections, go here. Poor people in mexico dont want to rely on government handouts so they are fundraising to pay for their own health care. Some NZers are helping with fundraising. what can we do about these heinous deeds? You believe in the tooth fairy too, Mr G? Mr G, for your information "provision of their own health, education and justice services" is code language for the fact that they are seeking to become independent of the State of Mexico. Think IRA, Kurdish "free" zones, Basques and any other guerilla army of separatists anywhere in the world from the Philippines to Biafra. The list is endless. Think "Aotearoa".... think "Armed Intervention Force" which IS currently operating within this country to challenge and ultimately overthrow the state of New Zealand. "Capacity Building Workshops" is another code description for activist training in the skills of resistance, civil disobedience and if necessary, armed insurrection. The main reason that these 'indigenous communities' want to work in 'their own indigenous languages' is because, having rejected the development opportunities (and work, healthcare and education) offered to them by society, they find themselves marginalised because of their own resistance to integrating in the country of which they are a part (or should that read 'apart?). The sods probably can't even speak spanish.. which makes them even less able to contribute and participate in society. Go and help them. Va ayudarles y buena suerte con la revolución! Well said Dave. My sentiments entirely. Trevor, you are doing an important job of peeling off the layers of spin and lies and exposing some of these organisations for what they are. Your writing is free of hyperbole and invective and you are good at simply and lucidly presenting the facts in their real light. Thanks. Please Dave - let's not elevate Trevor to being some bastion of free speech and impartiality - this is a personal blog, not a news source and anyway there is no such thing as "objectivity" - we live in post-modern times. Everyone's 'truth' is skewed by their perspective. His blog is very entertaining, though, I'll give him that. Thanks dave-that's what I'm trying to do. "there is no such thing as "objectivity" - we live in post-modern times. Everyone's 'truth' is skewed by their perspective"
That's the gap beteen us isn't it? I believe in attempting to approximate objective truth. I say it as an admirable virtue. You see life in more subjective terms. Helen, your 'postmodern' rejection of societal values and mores in favour of 'living one's personal truth' is exactly the sort of narcissistic onanism that one would expect from the cultural relativist viewpoint. Great for yoga communes. Bad for building a productive society. I don't subscribe wholeheartedly to post-modernism - my objection was to the idea that Trevor's site is somehow more impartial than any other politico site. Trevor - "Approximate objective truth" is a nice ideal, but ultimately impossible. The things you choose to focus on, alone, let alone the conclusions you draw from them, make your site highly subjective - despite your best intentions. Dave - I have very strong societal values - many based on the notion of collectivity. I think 'individualism' is best left to ACT and the neo-liberals, thanks very much. By saying 'living one's own personal truth' implies you think I'm a new-age hippy type. Can I categorically say I abhor New Agism. Most New Age ideas, products, books, groups etc have at their root nothing more noble than capitalism - as in, "let's prey on people's insecurities and the hole in their hearts where genuine community used to be and sell them crap to make them feel better." Dave - I know it would make you feel better to be able to quickly pigeon-hole me as some wacko-hippy-leftie or whatever, but unfortunately people are more complex and less-easily defined than that, and people with 'extreme left' views are all around you - some even live in quiet suburbs! so while it might make you feel better to imagine the far left are a marginal group dwellng in squats in the big cities and on rural communes - the reality is far less exciting, less simple and therefore probably less comforting to you. There is no "us and them." OK - back to work. Helen, thanks for that, but I realise that there are socialists all around me.... even in the quiet suburbs! There are socialists in government and even the major opposition party is almost completely socialist too, so one can hardly escape the fact. This is why we are sliding off the bottom end of the OECD. There's nothing wrong with strong societal values, but when you quote the 'notion of collectivity', this is where our paths diverge, especially as you seem to use the word 'individualism' as a kind of mild slur or reproof. As an ex-hippie commune dwelling crystal healer who has seen the light, individual self-responsibility trumps the notion of collectivity any day in my book, thank you. You never quite know what kinds of freaks you might be collecting with, if you get my drift. It sounds like you gave up on collectivity because your feelings (ego?) got hurt. I don't find working with other people so scary, on the whole. You began the idea of individualism as a slur when you suggested I adhere to the notion of "living one's personal truth". Maybe I misinterpreted what you were getting at there? Mother, writer and university teacher. (Not that it's relevant.) I hope you earn your living doing something you enjoy, also. "Think IRA, Kurdish "free" zones, Basques and any other guerilla army of separatists anywhere in the world from the Philippines to Biafra. " Think USA breaking away from the British Empire, think Soviet satellites breaking from the eastern bloc, think Tibet, think Biafra, etc. ""Capacity Building Workshops" is another code description for activist training in the skills of resistance, civil disobedience and if necessary, armed insurrection." Hilarious! If I show you a duck, I guess you'll insist it's a chicken! The American colonies were founded by British people who emigrated there to get away from the place, and to live by a set of values that they didn't find present in the 'ol country. They broke away when they achieved critical mass and the sheer force of their new social ideas outbalanced the hidebound political tentacles of Britain (not to mention the question of being over taxed!). There was no tribalist backward thinking or question of ethnicity involved... neither was Britain anywhere near being an 'Empire' at the time. The soviet satellites broke away (or rather, fell off) from a rotten core and the main motivator was economic, not ethnicity and 'traditional' values. What's your point about Tibet? Hahaha.. the Dalai Lama and his fantasyland disneyesque feudalism? What would be your preferred outcome on this one? You've lost me completely there, I'm afraid, unless you would care to debate the motion "Terminal Rabies is a better condition to endure than having to live with a stake through your foot." IE9KKf The best blog you have! Who Supported Marama Mayrick's Radical Film?